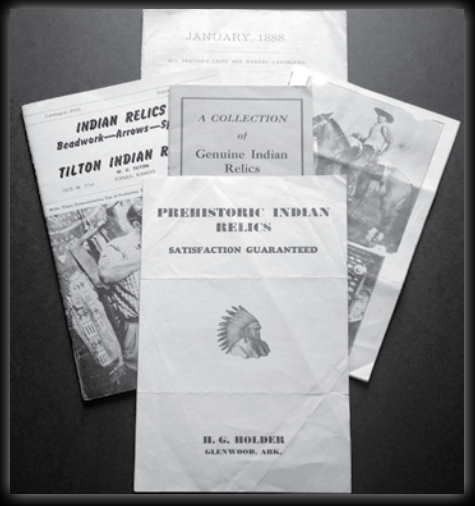 Figure 1.Examples of early curio and relic dealer catalogues that offered Native American artifacts. Actually, when adjusted for inflation, some of those prices were not as “cheap” as they may seem. And what a shame it was that at least some of the inventory offered in the catalog had apparently been “robbed” from the earthen mounds that today are so rare in undisturbed condition. Even the old catalogs themselves have become valuable as collectibles. In a 2016 online auction a pair of “Indian Relic and Curio” catalogs issued in 1911 and 1912 were listed with a starting price of $595. A comprehensive article by Batkin (2004) in the magazine, American Indian Art, discusses in some detail the history of the trade in American Indian relics, particularly with regard to those from western cultures, and the role played by dealers who published mail-order catalogs. Batkin points out that fewer than 15 different catalogs published prior to 1890 in the Southwest and Rocky Mountain regions are known to still exist, making the catalogs far rarer than the artifacts themselves. The earliest such catalog, actually a broadsheet, was issued in Wyoming Territory in 1874 by George B. Boswell. A bow, six arrows and quiver could be had for $5.00 (or about $105 in today’s dollars). Lar Hothem published a fascinating little book in 2001 that reprinted the contents of 13 relic catalogs issued over the period 1887 to 1958. Hothem’s book is a very useful reference for tracking the values that dealers placed on archaeological materials over that long span of time. The question of ethics certainly arises in considering these relic and curio catalogs. Issues relating to authenticity and the lack of provenance are frequently in question. And the manner in which the artifacts were obtained, often unknown by the potential buyer, is always a concern. It is not unrealistic to think that some may have been looted from important archaeological features. The book by David La Vere (2007) concerning the tragic destruction of Spiro Mounds in eastern Oklahoma as collectors and fortune hunters looted spectacular and irreplaceable artifacts, with no regard to acquiring archaeological information, is a classic in the realm of archaeological catastrophes. That mid-1930s period was among the darkest in the history of our abuse of American archaeological sites. We can presume that many Spiro pieces continue to circulate among collectors and museums and that the true origins are now unknown. But in addition to ethical issues regarding authenticity and source or origin, there is also the matter of the kinds of things being sold. For example, the catalog issued by W. G. Tilton in 1960 lists an “Indian Human Lower Jawbone” from an Ohio mound, a presumed trophy piece, for $20.00. And a pricing guide published by American Indian Books and Relics, circa 1970s, lists the value of human skulls at $100, or $150 for skulls of the Flathead variety. The issue of ethics is obvious when human body parts are offered as collectibles, as are issues of legality. We, like most collectors, have especially treasured the artifacts we found ourselves, and that are of unquestioned authenticity. Second to those in desirability, in our opinion, are the informal collections made by farmers and other landowners that were assembled over the years while their land was being cleared, plowed, excavated and otherwise disturbed. In North Carolina such collections were often stored in cigar boxes, shoe boxes and jars. We never bought any of those, but we enjoyed inspecting them and learning about the artifacts that might be encountered in a given area. Occasionally, we found that the owners of those pieces considered them to be of no or negligible value but nevertheless kept them as curiosities. One young child on a share cropper farm was perplexed that we were out looking for what he called “Indian rocks,” thinking them to be nothing more than unusual rocks or stones. Although he had seen many in his fields he never bothered to pick them up. In retrospect, I wish we had been more thorough in cataloging the informal collections we encountered because they at the very least had excellent provenance. There was no question about where they were from or whether they were authentic. Nevertheless, to assemble a stellar collection of Native American artifacts in current times, a collection that is diverse and of high quality, there is little choice but to purchase at least some pieces. Batkin (2004) contends that thousands of Native American artifacts in museums and private collections were originally acquired from curio dealers who issued mail-order catalogs. The challenge then, for reputable institutions and collectors, is to purchase exclusively from sources that can provide indisputable provenance for the artifacts, and to insure that they were obtained legally. To include artifacts with uncertain or shady pedigrees, or that are of questionable authenticity, can readily dilute the integrity and value of an entire collection, not to mention the pleasure of ownership. Considering that many thousands of artifacts have been cycling and recycling through the hands of countless dealers and collectors, the challenge of acquiring only artifacts that meet the above criteria is daunting. The community of artifact hunters and avocational archaeologists is broad and quite old. Founding Father Thomas Jefferson undertook the excavation of a Native American mound in 1764 and in some circles, is even considered America’s first scientific archaeologist. Former President Jimmy Carter recounted his love of artifact collecting in one of his autobiographical books (Carter 2005). Even iconic mystery writer Agatha Christie had a fascination with archaeology (Devers 2016). It is no wonder that relic and curio catalogs have been around so long, and that as it becomes increasingly difficult for the average person to assemble a collection from personal finds, the trade in artifacts continues to thrive. The authors of this article surface-collected from 83 sites they discovered in the North Carolina Piedmont in the late 1960s (Murphy and Murphy 2009). Over a three-year period more than 6,000 artifacts were collected, most of which were given to, and archived at, the Research Laboratories of Archaeology at the University of North Carolina, Chapel Hill. Detailed county maps on which were marked the location of each site were provided along with the artifacts. Of our 83 sites, 50 had not previously been known to UNC’s archaeology laboratory. Although at the time we did not purchase or trade artifacts, some years later, in 1978,we did acquire a single piece for our personal collection. It is a large, bifacially-fluted, point, thought to be of the Clovis type (Fig. 2). We bought it at an auction in which an elderly Michigan collector was selling his large, lifetime collection of artifacts. We were assured that all the artifacts, including the Clovis, were authentic and acquired legally over a period of many years. But did we have proof of this? No. We bought the point to be used as a prop by the senior author, a professor at Michigan State University, in lectures and field trips concerning the ecology of the early people of North America. 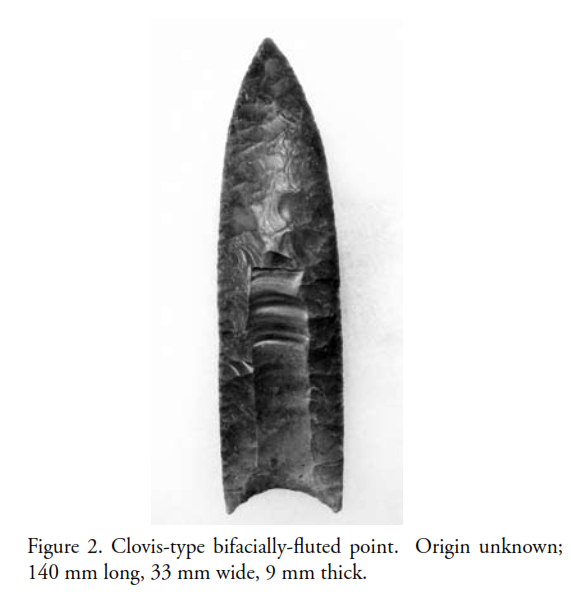 For that purpose, the Clovis point was perfect, especially in a landscape dotted with ancient bogs that sometimes contain the fossilized bones and tusks of wooly mammoths and mastodons known to have been hunted by Paleo-Indians, some of whom used fluted spear points. But because we have no substantive information relating to the point’s provenance, or its authenticity, we have never felt comfortable in displaying it with the points, axes and other artifacts that we had found ourselves, even though none of our personal finds come close to matching the workmanship of that big Clovis. It’s a bit of an enigma. The Clovis almost seems too good to be true: so large and so perfect. But it appears to pass the authenticity tests and we accept it for being such. And yet, a scintilla of annoying doubt persists. We wish we could say we found it ourselves, or at least that we had clear-cut, reliable documentation, but we didn’t, and we don’t. The fluted point served beautifully as a prop, but not as a prized focal point of our collection. We keep it aside in a separate display case so that it is not confused with our personal finds which are all of unquestioned authenticity and provenance. The main objective of this article was to bring emphasis to the long history of Native American artifact collecting, marketing and trading, and the factors to be considered in making acquisitions. Today’s reality is that there are significant limits to which quality collections can be built through personal finds, particularly in the context of legal constraints and heightened sensitivity on the part of private land owners. Additionally, agricultural practices that once tended to expose artifacts on the ground surface have changed, making surface collecting more difficult. Auctions, ranging from local affairs to large, highly publicized events accompanied by slick and expensive catalogs, have become increasingly common sources of artifacts for collectors at all levels. And, of course, there are numerous sources on the Internet. In many ways today’s collectors carry on the tradition of the early mail-order dealers who bought and sold artifacts well over a hundred years ago. Many of those artifacts were real. Many were not. Many were acquired legally. Many were not. As with any kind of collecting, the challenge is to acquire only the pieces that meet the highest standards with regard to provenance and authenticity. In our view, personal finds are to be particularly cherished, but only if they are fully documented, giving them provenance and thereby value to our archaeological heritage. 1888. Scott Stamp and Coin Co., Dealers in Foreign Postage Stamps, Coins, Postage Stamp Albums, Minerals, Curiosities, Etc. Broadway, New York City, New York 32 pgs. Circa 1970s. Bone, Shell, Copper, and Wooden Relics of the American Indian. American Indian Books and Relics. Huntsville, Alabama. 15 pgs. 2004. Mail-Order Catalogs as Artifacts of the Early Native American Curio Trade. American Indian Art Magazine 29(2): 40-49. 2008. Authenticating Ancient Indian Artifacts. Collector Books, Paducah, Kentucky. 240 pgs. 2005. Sharing Good Times. Simon and Schuster. 192 pgs. Circa 1912. Antiques, Relics, Arms, Etc. Bargain List E. Kent, Ohio. 4 pgs. 2016. Agatha Christie, Archaeologist. Fine Books & Collections. Issue 14.2/Spring: 11-12. 2001. Indian Relics from the Catalogs of Old-Time Dealers. Hothem House Books. Lancaster, OH. 177 pgs. 2007. Looting Spiro Mounds, An American King Tut’s Tomb. Univesity of Oklahoma Press, Norman, OK. 255 pgs. 2009. Exploring for Sites in North Carolina’s Piedmont of the 1960s and Getting to Know an Archaeology Legend. Central States Archaeological Journal 56(4): 196-199.